Like most people who exercise outside on a regular basis, I have standard routes. I'm beginning to learn the nuances of these routes, such as which off-camber corners force me to apply my bike's brakes, and which ones I can really let rip. I know which rocks to hopscotch on my usual eight-mile run and where to look out for deer. Standard routes are comfortable, convenient, and help boost me through tough days with their familiar challenges. They provide a great base for training, because I can compare times and how I felt and how I improved. Still, I find myself craving something different. Even if it means venturing just a few miles off that beaten path, to places where I have to brake on all the corners or purposefully operate below maximum effort because I have no idea where the hill I'm climbing ends. Beat and I have been trying out new running routes. 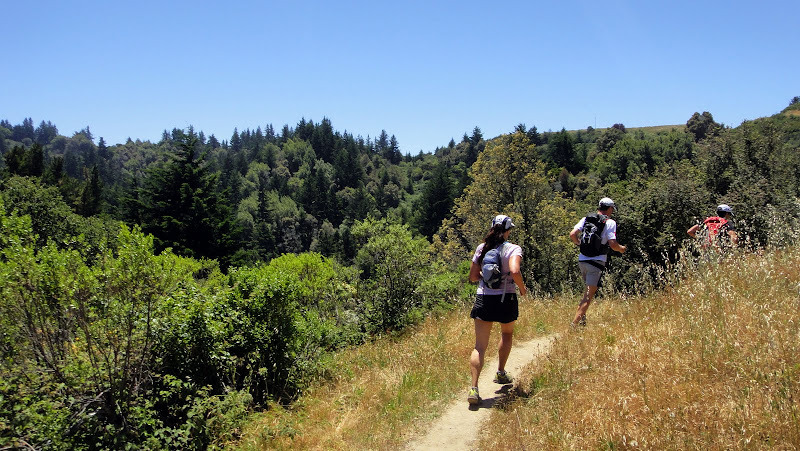 My recent run-loading has made it tougher to digest the idea of a daily trips to Rancho, so we've been testing out lesser-known home trails with encouraging results. 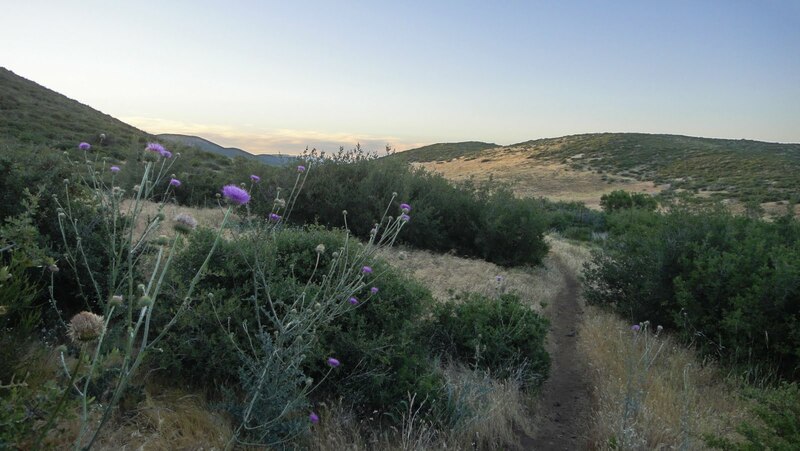 On Monday, we finally connected the "Steven's Reservoir Loop," a quiet 6.2-mile jaunt up the crest of Coyote Ridge, down a winding piece of delicious singletrack and along the steep shoreline of the reservoir. Rocky cliffs, golden light and turquoise water — like a little piece of Hawaii close to home. Today Beat was going to rest to try to stave off his cold, but then it rained. I mean, it really rained. The temperature dropped to 58 degrees and gray mist tumbled down the canyons. On the way to the post office, I heard a host on the radio complaining about taking out her rain jacket "for the seventh time since March." She said it without a hint of irony. I knew this signaled a rare summer event indeed. When I returned home Beat was just as thrilled as I was about the rain. We decided to take our evening run to the rainforest, otherwise known as Windy Hill. The trails were mired in a strange combination of mud — sometimes slimy and slick, other times shoe-grabbing sludge, and still others as solid as concrete, but all basically the same texture and color and all unpredictable. It made for really challenging running — more about survival than a solid workout. But the landscape reminded me of Southeast Alaska in the summer, and this made me feel blissfully content. 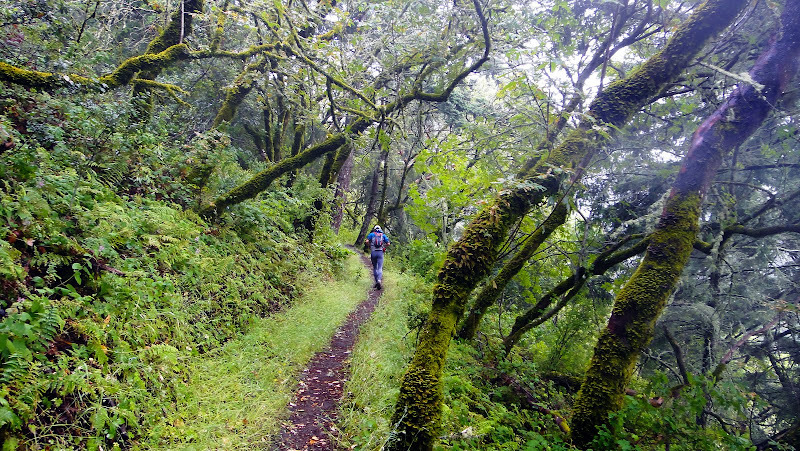 Who says you can't have a little outdoor adventure in metro California? Sure, I move slower through the unknowns, and yes, it is more risky to go trail running in the rain. But really, the ability to explore the greater outdoors is the entire reason for fitness, at least in my own personal application of fitness. Sometimes that means an enjoyable interaction with the familiar, and other times it's a blind leap to something surprising and new. But in every case it's what I enjoy most about day-to-day life, these little adventures. I can always tell when I'm having a bit of an "off" week, because I don't blog much. Busyness and heavy involvement in activities don't curtail my blogging habit; in fact, I tend to blog even more frequently when lots of good things are going on. But this week has been a tough one. Good, but tough. I am trying to delve into a new writing project that has been slow to launch. Meanwhile, I've decided to let any marketing efforts for my latest book simmer for a while, so during the days this week, I've found myself staring bewildered at a blank document on my computer screen with no justifiable distractions for my writer's block. And then there's the running. I put in a big (for me) week of trail running, with 17.5 miles on Monday, eight on Tuesday, 32-mile road bicycle ride on Wednesday, eight more on Thursday, rest day Friday, eight on Saturday and 23 miles today. That's a 64-mile run week, with about 15,000 feet of climbing (including the ride). It only included one day of cycling in seven. Honestly, that's a lot of running for me. But that's not what made it tough. What made this week tough was its direct correlation with a big high pressure system that brought overwhelming sunshine and temperatures in the 80s and 90s all week long. Just a typical summer week, but I took it hard. After my literal heat meltdown on Monday, it took me three solid days to recover. I felt similarly run-down, weak and pukey on Tuesday and even during my road ride on Wednesday, and it took a 10-degree drop in temperatures for me to feel closer to normal on Thursday. The rest day on Friday was a good idea and by Saturday I was back to feeling mostly like my old self, even in the same heat the crushed me earlier in the week. But it's a bit frightening to me just how awful I felt on Monday, Tuesday, and Wednesday. This is a whole new battle for me. Dealing with extreme cold is easy; you just put on more clothing. But heat can only be fully combated with proper acclimation, which, as far as I'm concerned, means too many outdoor outings that are no fun at all. Give me extreme cold over that any day. Good thing this is my "off season" and I only have a measly 100-mile foot race that I'm training for right now. But the weekend ended on bright notes. Beat and I finally broke down and bought the Subaru Outback that we've been fantasizing about since we drove my 1996 Geo Prism from Missoula to Kalispell in November through a blizzard, a white-knuckle experience that neither of us ever want to have to repeat. Most of my friends, my parents, and even my former employers have been razzing me to get rid of my car for years now. It's tough because I'm extremely attached to that old car, possibly as much as I am to any of my bikes, even Pugsley. Geo and I have just been through so much together. I was barely 21 years old when I bought that car, and it followed me through all the major adventures and changes in my life since then. But I accept that it's an inanimate object and a mechanically challenged one at that. 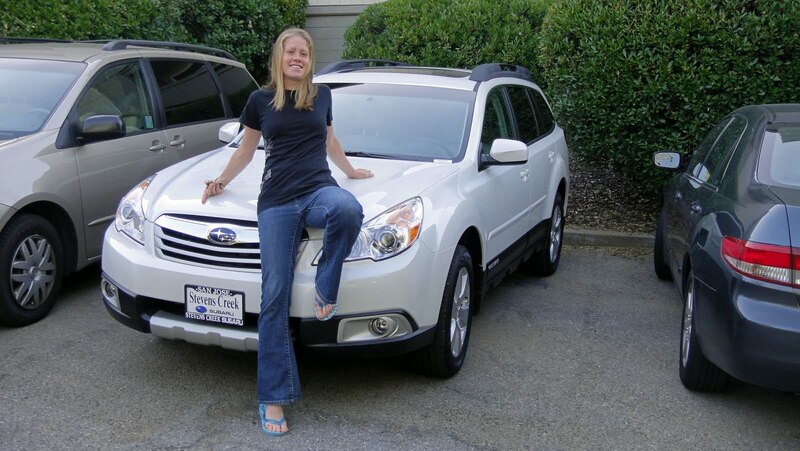 And of course, a brand new Subaru can help an adventurous person get over her old-and-weak sedan real fast. I mostly bike commute around town, but we needed a good "adventure" vehicle for road trips — the kind that can handle mountains and snow once winter comes around and we're back to the "on" season. Today I set out with Beat and our friends Harry and Martina for the week's longest run. It was actually a rather pleasant day, still sunny and warm but at least never close to the 90s. We started at the bottom of Windy Hill and climbed to Skyline. Beat recently caught a cold and Harry and Martina were suffering from various injuries, so they decided to turn back at mile 5.5. I actually felt better than I had all week long, even at the end of a heavy-loaded running week, which leads me to believe that heat really is my kryptonite and without it I can run as much as want. Ha. A woman can dream. Of course I took today's run fairly slow and drank a whole lot of water. I filled up my water bladder twice over the 23 miles and was nearly out by the time I got home, meaning I drank nearly 200 ounces of water in five hours. I felt good the whole time, though, except for one severe side-stitch that caused me to basically walk downhill for three miles while I tried to work it out. I still have to figure out why I so often manage to get these side-stitches, regardless of temperature or distance or hydration levels or trail surface conditions, but only during steep descents. GPS track of Sunday's run here. It's a fantastic route that I highly recommend. This has been one of those "waiting and waiting" UPS deals, but I'm expecting my first shipment of my new book on Monday. So I'll be able to send out signed copies of "Be Brave, Be Strong: A Journey Across the Great Divide" starting next week. You can order signed copies for $15 plus $4.95 shipping at this link. Here is one more excerpt from the book. This is from chapter twelve, "Savage Side." I woke up draped in the silky sheets of a luxury bed, deeply sore. General muscle and joint soreness is always accompanied by wide-ranging emotions. There is comforting soreness, the kind that comes in the midst of hard training, because it signals sought-after muscle growth. There is satisfying soreness, that post-race glow when a person knows they have met their goals and can finally rest. There is debilitating soreness, the kind that follows injuries, lapses in judgment or an insistence on pushing oneself too hard. And then there is Divide soreness. Divide soreness is not so easily pinpointed, because it descends in waves over days and weeks. It starts as a sharp tinge in the larger muscles on day two or three. Then it slowly cuts into smaller fibers. Then it seeps into the blood, working its way into the recesses of long-forgotten and little-used regions of the body, such as pinky toes. Just when you find yourself wondering why your pinky toe hurts, soreness has found its way into your brain, casting a pain-soaked pall over even the simplest thoughts and decisions. Finally, Divide soreness needles through to the soul, full of bile and perpetual fatigue, convincing the unfortunate individual that Hell is not death’s purgatory but a state of being on Earth, and nothing will ever look or feel good ever again. Of course, the mercy of Divide soreness is that it doesn’t last forever, and comes and goes frequently during the course of the same race, and even the same day. But, leaving Butte, I felt none of the euphoria I had experienced while descending into town. The city looked gray and bland in the light of day, a scattershot of concrete in a wide, barren basin. “See, and you’re not even trying yet,” John said. John had taken me up on my recommendation of Idaho Falls as a good place to leave the Divide, and decided to follow me to southern Montana, which meant we would be riding together for at least two more days. I was glad he hadn’t decided to abandon the race in Butte, but grumpy enough that morning that I really felt like asking him to press ahead so I could indulge in a few hours of tuned-out solitude. John, on the other hand, had slept great the night before and was able to slam down a huge breakfast even though he insisted on going to the grocery store rather than Denny’s, which had been my preference. I had only managed to consume a yogurt and a pound of strawberries before I started to feel ill, and the only thing competing with muscle soreness for my attention was a discouragingly low energy level. John chatted amicably while I nodded and grunted. It was rude to acknowledge, but secretly I wished he would ride ahead so I could nurse my malaise. Near the top of the first pass of the day, a swift thunderstorm dropped over the mountains and John sprinted away from me. By the time the rain tapered off and I caught up to John on the other side of the pass, my sore muscles were finally starting to warm up and the Sour Patch Kids I had forced down my throat were kicking in. John pointed across a large valley bathed in sunlight but ringed by dark clouds. “So that’s Fleecer, eh?” I said. Fleecer was yet another notorious section of the Divide, a difficult-to-locate intersection with a treacherous, technical descent on the downside. The reputation of these places tended to fill me with a dread that was quickly replaced with glee upon arriving there. I found I preferred the somewhat ridiculous challenges presented by unrideable obstacle courses to the usual physical strain of simply riding long and hard. In fact, all of the places I had been warned about — Red Meadow Lake, Richmond Pass and Lava Mountain — were all the places I already regarded most fondly. At that point, I expected nothing less from Fleecer. As John put on his warm jacket and leg warmers for the descent, I pulled a little wax-coated cheese wheel from my feedbag, unwrapped it and popped it in my mouth. As I chewed, the creamy cheese oozed down my throat and lined my stomach with the most incredible sense of health and well-being. We dropped into the valley and crossed beneath the interstate. As we started climbing anew, I looked wistfully down the pavement as it snaked along the basin in a comforting, familiar way. “There’s the road of my childhood,” I said to John. “How far do you think it is to Salt Lake City?” John asked. “The Divide is an all-encompassing existence,” John agreed. I wanted to embark on a good long run today to kick off a big training week ahead of the TRT100. I was ambitiously thinking about something in the range of 20 miles at a solid running pace. I spent the morning inside my apartment completely absorbed in a project, and found it especially difficult to emerge from my tunnel when my planned 2:30 p.m. departure time arrived. I packed and prepped to leave, and vaguely decided to check the weather before setting out. It was 95 degrees in Los Altos. Wait ... what? I had yet to run in any real heat this summer. It's been in the 60s and 70s, at most the high 70s, during most of my outings since I moved here this spring. Well, I reasoned, it's as good of a time as any to get in some heat training. I decided it might be prudent to fill my 70-ounce water bladder to the top this time. I decided to hit the Skyline-to-the-Sea Trail because it's generally well shaded, and the overall mellow grade would allow me to run most of the 20 miles. I started off on the wrong foot by gulping down about 12 ounces of water before I even started running (my car has no air conditioning and I was already overheated after the 20-minute drive to the trailhead.) I then proceeded to launch into the gentle downhill grade entirely too fast. Less than a half mile in, a horrible cramp gripped my left side. "Gotta learn to run through this," I told myself, and pressed on. Three miles down the apparently little-used Saratoga Gap Toll Road connector singletrack, I ran through an overgrown drainage only to realize too late that the trail was lined with stinging nettle. I am really sensitive to stinging nettle; it causes my skin to break out in huge white welts that burn with the rage of a thousand suns. Halfway across the grassy gap, waves of fire began to crash against my legs. I screamed and ran faster but it was too late. My legs and left arm were covered in searing welts. I swore but what could I do? "Gotta learn to run through this," I told myself, and pressed on. At mile seven I was nearly out of water. I hadn't crossed a single running creek yet. Luckily there was a backpacker camp nearby. I stopped at the faucet and drenched my burning, itchy legs in water. It was surprisingly tepid and did little to put out the fire. I filled up my bladder and pressed on. At mile eight, I started to feel nauseous. I tried to sip more water and felt the warm liquid gurgling back up in my throat. I stopped running to avoid puking and forced down a couple of salt tablets, then tried to continue back up the trail. I suddenly felt quite weak and dizzy. My pace slowed considerably. At mile eight and a half, I decided any benefit I could glean from this training run had passed, and turned around. And of course, the trail back to Skyline Ridge is predominantly uphill. The heat needled into my core as I sipped water, fought the urge to puke, caved in to the urge to scratch the surface layer of skin off my legs, and generally tried to shut out the world with daydreams about frozen tundra and snow. The disassociation exercises helped a little, but that didn't change the fact that I had slowed to a 14-minute-mile pace even while running what felt like a full effort on a gradual ascent. I started alternating walking — and then predominantly walking — to cope with the nausea, but I felt fully cooked. I staggered back to my car certain that this had been my worst run, ever. In 17 miles I never felt good, not even once, and despite my resolve to press on through the worst of it in hopes it would get better, it only continually got worse. In that way, it was a valuable experience. I definitely learn more from the runs that go badly than the ones that go well. During today's run, I learned that when it's summer outside, I'm better off just staying indoors, the way other people do when the world is covered in ice and snow. But more realistically, what I need to do is work on my heat acclimation and fluid and salt intake, and probably build up to three-and-a-half-hour runs in 90-degree weather more slowly in the future. So what makes for a tougher, more physically taxing day: An eight-hour trail run or eight hours of hard-labor trail work? I got this question a few times during our Saturday stint with the Tahoe Rim Trail work crew. And honestly, unless you're better trained for the effort of guiding 600-pound boulders down a 50-degree sandy slope for 100 meters without losing them in a clattering tumble while screaming "Rock! Rock!" ... I'd be inclined to say the latter is the harder effort. We met up with the crew in a casino parking lot in Stateline, Nevada, and made our way up a brand new, yet-to-be-opened connector trail to the TRT. 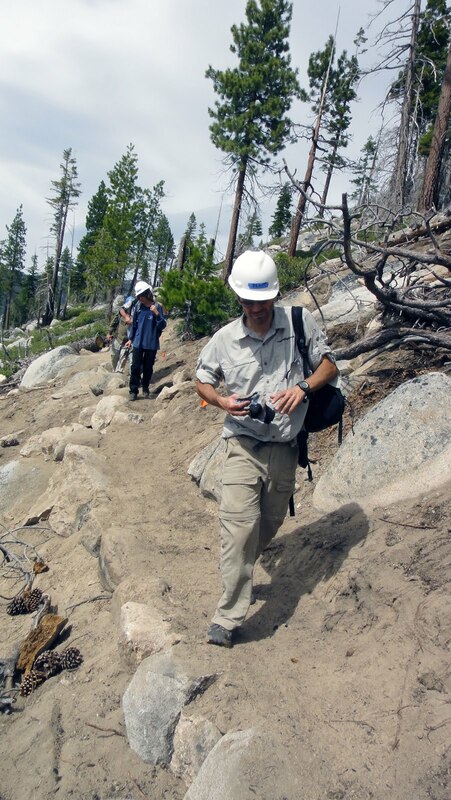 We donned hard hats, work boots, and leather gloves and marched up the beautifully sculpted trail until we reached a point where it resembled more of a mountain goat track along a rugged sideslope. This is the point where we set up shop. The only trail work I've participated in the past all involved minor maintenance — clearing away brush, chopping out limbs, moving deadfall, that sort of thing. I've never actually built a trail. So when I was assigned to the "rock wall crew," I didn't think anything of it. As it turns out, the on-trail construction of rock walls is nothing like I imagined it, which was admittedly more in line with laying perfectly symmetrical bricks in pre-mixed mortar. 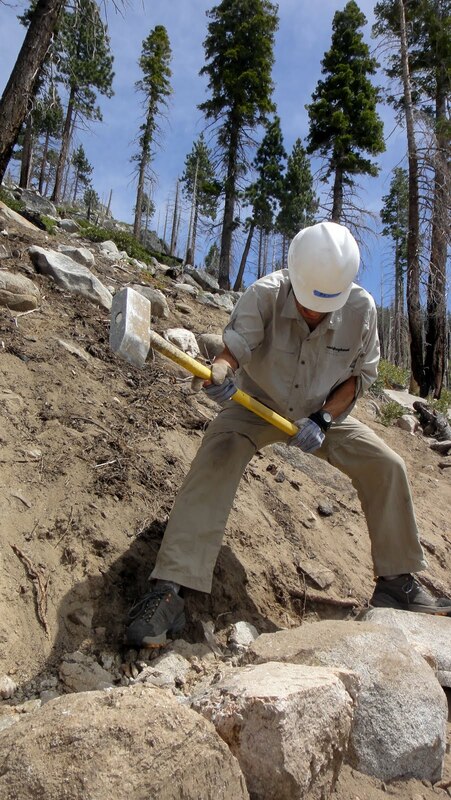 No, in real on-trail rock wall construction, you are given a pick ax and a very heavy iron prying tool, and pointed in the general direction of a very steep slope were you must gather all of your building materials, which you must move using brute force with a little help from gravity. And you can't use just any rock — they have to be rectangular, with flat bottoms, solid granite, and about the size of a carry-on suitcase. Eventually you have to go very far up the mountain to find such rocks. Then, not only do you have to guide them safely down the mountain, you also have to position them perfectly in place, somehow, without straining your back or scraping your arms or bruising your foot or jamming your finger. Beat and I were both unsuccessful in this regard, and sustained a number of small injuries. Once all the big stones were in place, we had to gather up piles of smaller stones and crush them into fill for our trail. 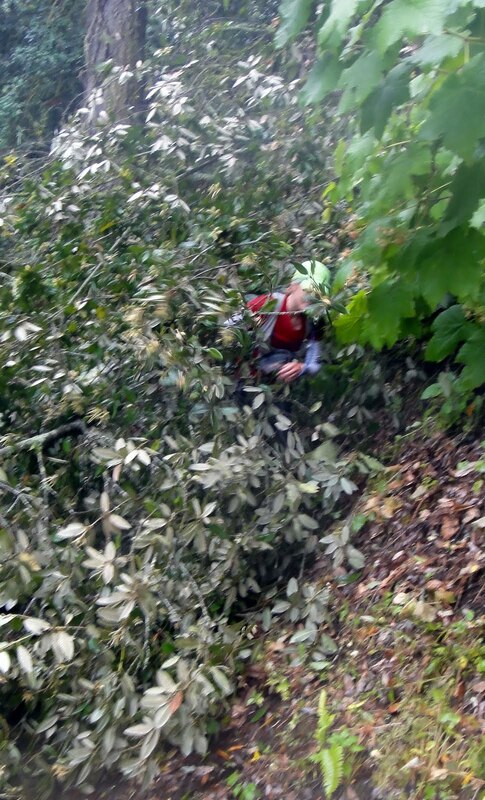 I dripped sweat and gasped for oxygen as I skittered up and down the steep slope gathering rocks, but Beat really had the tougher job with the sledge hammer. At least he looked good in the process. 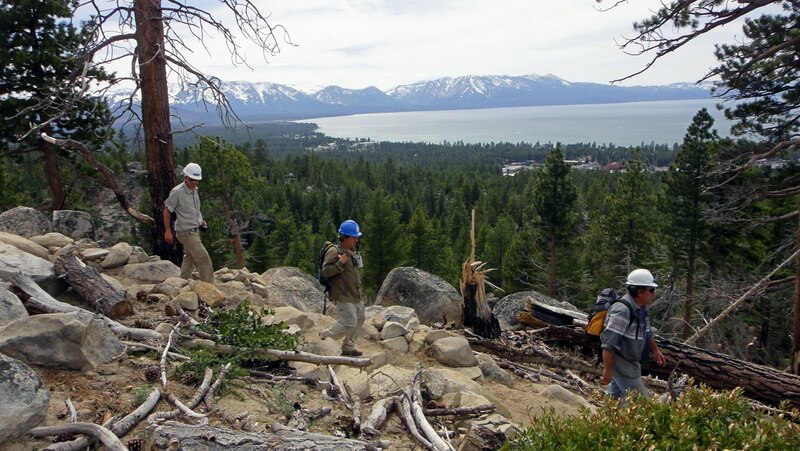 Sweaty and completely coated in dirt at the end of eight hours, our crew of five paused briefly to enjoy our creation — about 50 feet of new trail. Fifty feet. I tell you, I am never going to look at a rock-lined section of trail the same way. 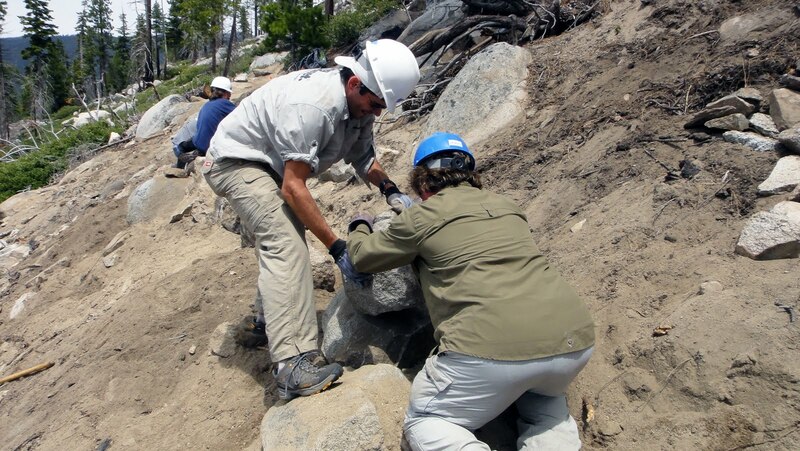 It's truly amazing how much labor goes into trail creation, and I'm glad I had this fun experience to give me a new appreciation for trails and the people who build them. 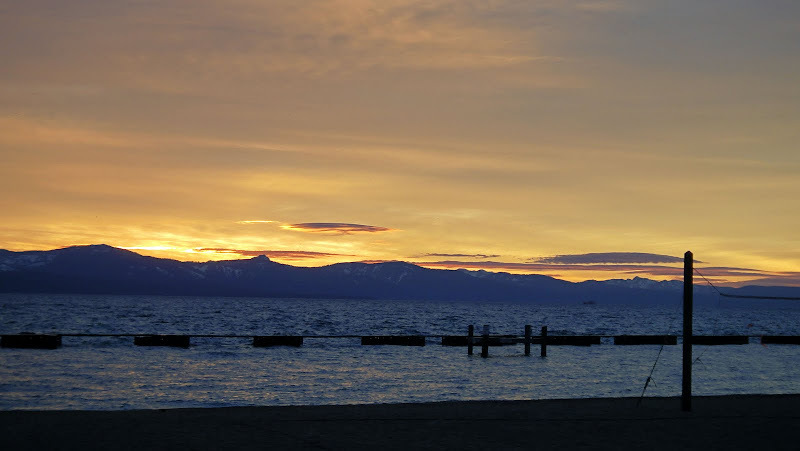 The evening brought a beautiful summer sunset over Tahoe Lake that we were almost to knackered to enjoy. But we did rally for a short walk near the beach. 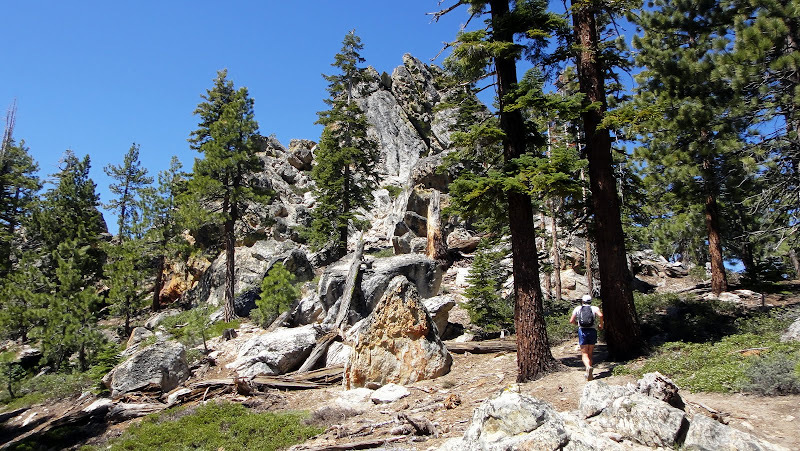 On Sunday morning we set out to enjoy miles of other people's labor on the Tahoe Rim Trail near Castle Rock. I saw an uncountable number of rock walls along the trail, and could only shake my head in disbelief. 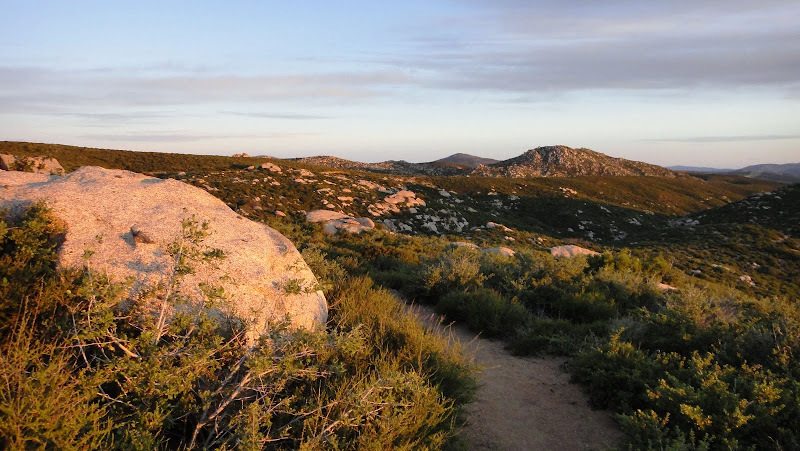 The trail was perfect for running — rolling and smooth with just enough rocks and boulders to keep you on your toes. 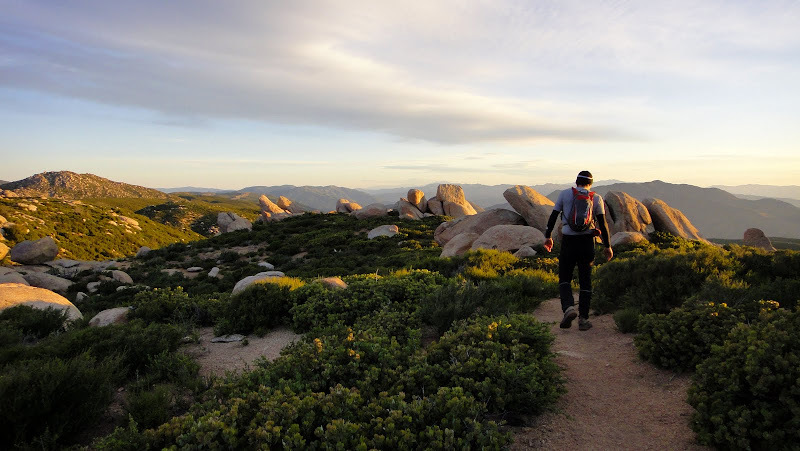 The fact that this trail is so runnable, yet still fairly steep and somewhat technical, is going to make for a uniquely tough challenge for the Tahoe Rim Trail 100 next month. I'm probably going to be tempted to run more often than I should over that distance. Not to mention the elevation averages about 8,000 feet. I could feel the thin air more during the trail work yesterday than I could running today, but still ... this is going to be a fantastically tough race. I really need to log some running miles this week and start working on getting my head in that game. Finally, I was amazed to come back and see how many people commented on my last post over the weekend. It was really fun to see the different connections — it seems a large number arrived here either through fat bike interest, my 2007 NPR commentary or the Fat Cyclist, and it's awesome to see so many of you stuck around all these years, even after I moved away from Alaska. It was also fun to see greetings from old friends and also familiar names from the "way back" days of my Homer posts. Thanks to everyone who took the time to comment. I used an online random number generator to draw three names for the book giveaway. I listed the names and comments below. If this is you, please e-mail me at jillhomer@arcticglasspress.com with your address and I will send you a copy of my new book, "Be Brave, Be Strong: A Journey Across the Great Divide," which, incidentally, just became available in paperback on Amazon. I'm awaiting my own shipment and expect to have signed copies available by the end of the week. Check back! KB: "I found your blog in 2008 via a link on another mountain biker's blog. You probably don't remember but you helped me decide to buy a snowbike by answering my questions about how well one *really* works. I've adored it (a Fatback) and ride all winter long on the Colorado trails." Carol: "Hi Jill, I found your blog the summer of 2009 while doing a Google search on Alaska for places to live. I was wrapping up nursing school at the time and live in the brutally hot city of Phoenix. I was overwhelmed with endless assignments and clinical rotations and unable to make the trek to the mountains in Flagstaff to cool off. I found your blog while you were riding the Divide. I went back and read every posting you had written. Being stuck in school at the time I was so envious of your freedom and sense of adventure and was able to live virtually through your blog. Thank you so much for sharing the incredible stories and photos of your adventurous life with all of us!" Shannon P: "I've been following your blog since um, not sure really! it was still "Up in AK" back when I found it, and I was researching fatbikes (aren't pugs grand? )...loved the pics, attitude, and exploits and have been reading every since!" I've mostly stayed off my feet this week in a pre-emptive — though hopefully unnecessary —hurty-foot recovery plan to avoid plantar fasciitis. Instead, I completed three solid bike rides, one mountain and two road, all in the 25-to-30-mile, 3,500-feet-of-climbing range. 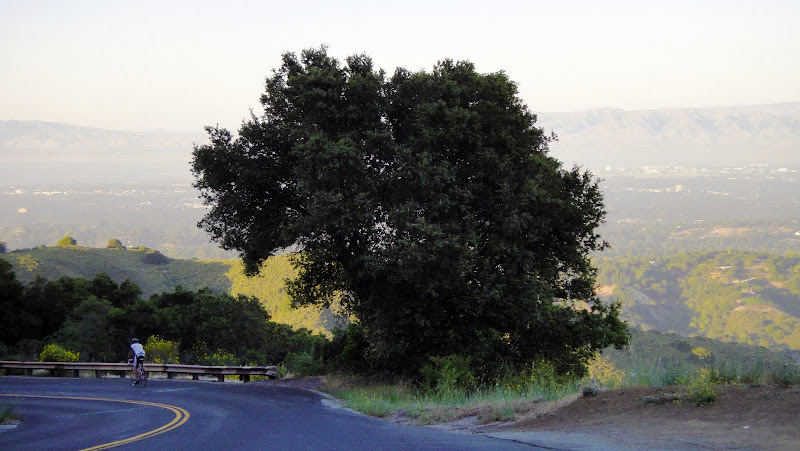 Where I live, at the base of the Santa Cruz Mountains, there a few appealing routes that don't involve at least 3,000 feet of gain. I can either grunt up to elevation or spin through suburban streets and traffic, so I choose the climb, every time. I think the constant climbing has helped improve my strength as a runner, even though I clock significantly more hours on my bikes than on foot. Of course, riding bikes does nothing to help me improve the areas where I'm really weak, such as downhill running and foot strength. I'm in a unique position because I love ultrarunning races but don't necessarily enjoy training runs; and while I love riding bikes, I'm not all that crazy about racing them. I wish there was a way I could do all of my weekday training on bikes and still survive long weekend runs. Yes, I want it all. Meanwhile, Beat has really taken to my singlespeed, the old and busted Surly Karate Monkey. Even though I rode it untold thousands of miles before, during and after the Tour Divide, and even though the Reba shock is shot, the wheels are ancient, the tires are worn and various parts are creaking, and even though the frame is too small for him (hello toe rub), he's still been grabbing it as his bike of choice on our evening rides. He even rode the singlespeed the day after the San Diego 100, clearing all of the steep pitches that give me stomach aches when I'm fresh. Beat says he enjoys singlespeeding because it draws his concentration away from his bicycle and gear, and allows him to respond to the terrain with body movements. In that way, it's more like running ... which gives me more training ideas. In final news, I finally got my last book proofs through the system and am ordering my first batch of paperbacks, so they should be ready to distribute by the end of next week or early the following week. (Link to eBook here.) They also will likely be available on Amazon and other online book retailers within that time period as well, but I will be offering signed copies for a couple bucks cheaper, so you should buy them from me. I'll start offering pre-ordering on Monday. For now, I have three copies of my new book to give away to three random blog commenters. I've been posting updates to this blog since November 2005, and obviously this blog has changed and evolved quite a bit since that time (as have most people over six years of their lives.) I've always been a little curious if there's anyone left who read this blog way back then and still checks in from time to time. So for a chance to win a book, all you have to do is leave a comment with a guess of when you first noticed my blog (formerly "Up in Alaska") and how you came across it. Even if it was just two minutes ago because you Googled "Are All Alaskans Crazy?" If you don't want to post your name or info, just type in an alias. I'll randomly draw the winners and post them here on Monday with a request to e-mail me so I can mail you a book. So again, leave a comment telling me when you found this blog, and possibly get a free book! Easy! Hope everyone has a great weekend and does something long and fun. 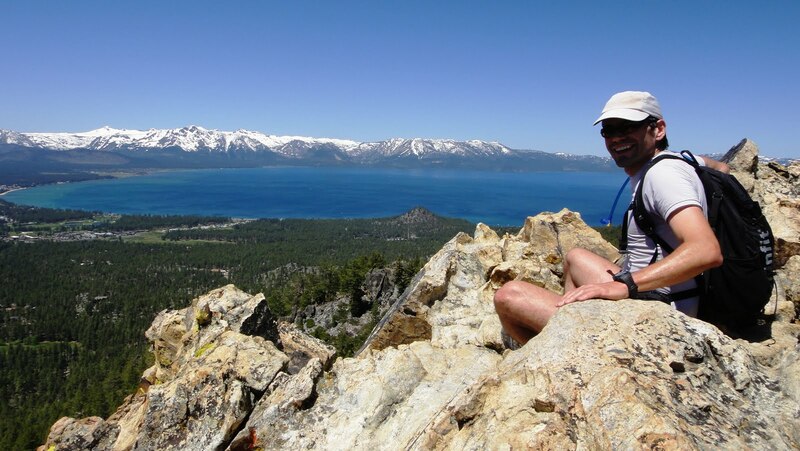 I'm headed to the Tahoe area to do some trail work and maybe squeeze in a training run near the TRT100 course. Here's hoping I get to traipse through some snow. 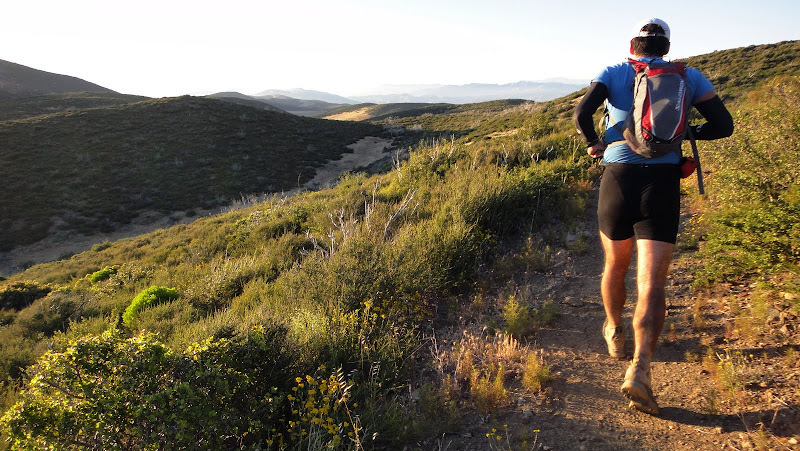 The sport of ultrarunning incorporates a particularly unique practice that participants refer to as "pacing." I can't think of a single other sport where an individual athlete recruits another runner, usually a volunteer or friend but sometimes paid, to shadow them on the course for a fair portion of the race and provide what basically amounts to emotional support. Physical support is discouraged and "muling" (carrying of any supplies) and short-roping are outright forbidden. A pacer can help with navigation (no, [insert fatigued runner's name here], that's a yellow ribbon, we go right. Yes, the ribbons were always yellow.) Depending on the runner, a pacer can also play the role of a relentless drill sergeant (What? Your feet hurt? Well you better start crying, because your feet are going to hurt a whole lot more if you don't pick up the pace soon), or soothing caretaker (I promise it's only three more miles to the next aid station. How many to the finish? Um ... not many more.) A pacer can also provide a voice of reason amid the pain and delusion (Yes, last I checked there were no reports of pink rabbits around here.) But what do pacers actually do? Why is pacing so popular, even among top competitors? And what's in it for the pacer, really? Half the work and none of the glory. The common motivations for pacing in ultrarunning still elude me. I personally approve of pacing, for the very reason that it allows an opportunity to enjoy all of the camaraderie and scenery of a particular race without the responsibility or competition. Race pacing holds a special place in my heart because that's essentially how Beat and I, in our own strange and elusive styles, coerced each other into a first date. 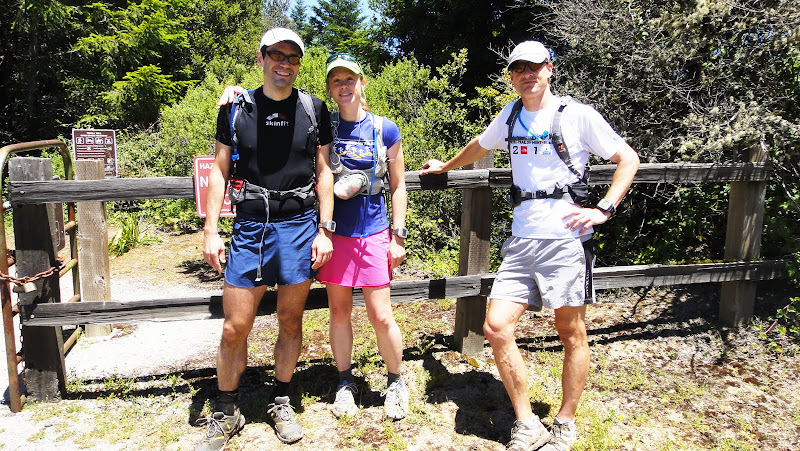 Shadowing Beat for 50 miles of the Bear 100 last September was a fantastic and memorable experience, and similar to other couples who enjoy revisiting the location of their honeymoon, I like to believe we can recreate the magic. 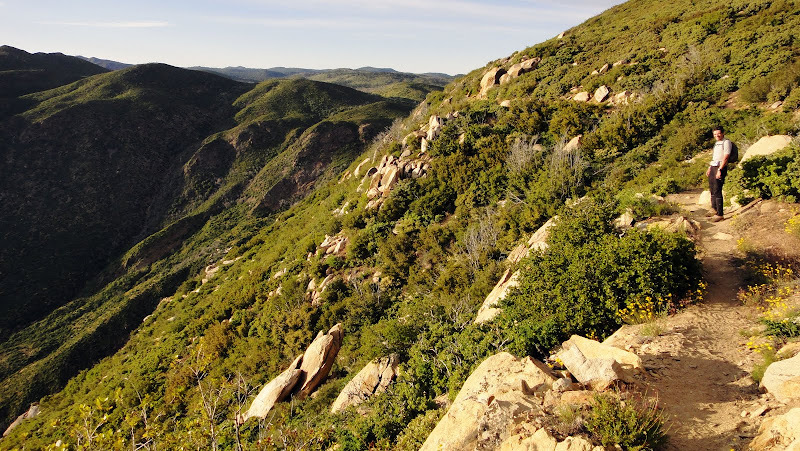 The San Diego 100 is held in the Laguna Mountains about 35 miles east of San Diego. 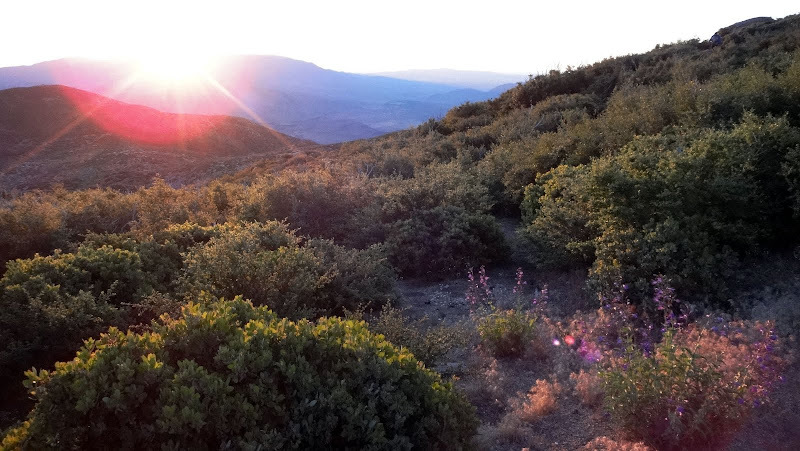 It's an intriguing region, with conifer-studded mountain tops, wildflowers and green coastal shrubs on the west side, and the stunningly barren Anza Borrego Desert to the east. Just before the morning of the race, a thick layer of marine fog drifted in from the coast. 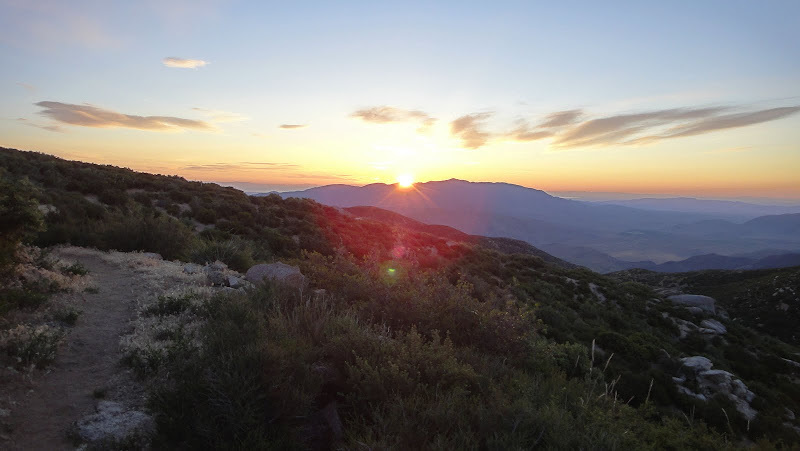 It burned off to reveal a brilliant blue sky before the 7 a.m. start, but not before trapping an air mass that kept the higher elevations unseasonably cool while hot desert air gathered below. I watched Beat and our friends Harry, Steve and Martina start, the set to whittling away the morning with lots of breakfasts and blogging. The race checkpoints were all on the higher ridges, so I sat and shivered in my fleece jacket while my friends withered in the oppressive heat on the trail. Martina, the friend I was originally set to pace, developed stomach issues at mile 13. She battled on but unfortunately timed out at mile 31. Steve slumped into the 44-mile checkpoint with white streaks of salt across his shirt and a palpable expression of distress on his red face. He told me the heat was annihilating the runners and he could no longer take in food or water. He admitted to obsessively fantasizing about the extreme cold of the Susitna 100. Beat looked a little better for the wear after a volunteer gave him two Popsicles, but I drove toward the mile 51 checkpoint expecting carnage. The moment was so similar to the way I remembered it, the way it was in September. 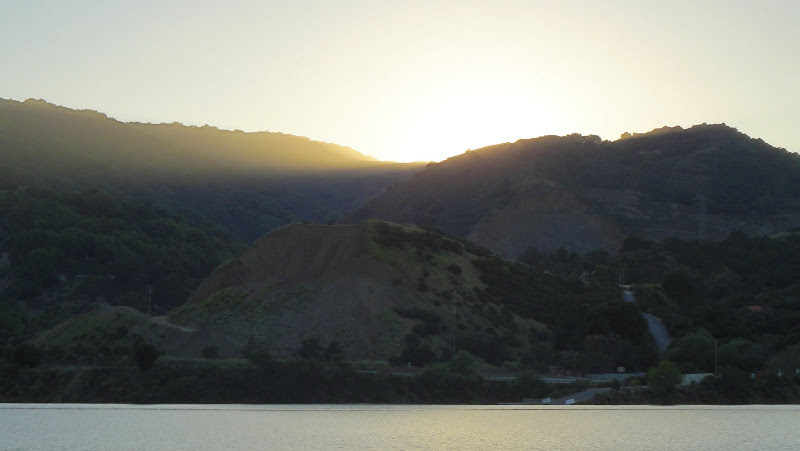 The sun drifted below a nearby hillside and orange light spread across the horizon. Cool air settled as the breeze began to dissipate. I wasn't quite prepared because I had only just arrived at the race's halfway mark, and was still sitting in my vehicle when I noticed Beat's distinct grin and blue Skinfit shirt weaving through a crowd of spectators and volunteers. I nervously approached him and received the same playfully stern look. "Well, are you running?" Of course. That was the plan, even if it wasn't always the plan. I shouldered my hydration pack and grinned. This wasn't the Bear 100 anymore; I wasn't a beginner anymore, with ultrarunning or with Beat. We set out together into the expanding evening. I really do love running overnight. The world closes in and hours drift away. Focus narrows tightly and opens to new and unexpected spaces, sometimes at the same time. The overnight trek is one of the best reasons to run a 100-miler, and, in my opinion, the best half of one. Beat had weathered the heat of the day fairly well, but the rocky desert trail had chewed up his feet, literally. We jogged the flatter portions of singletrack — this was difficult for even me due to the technical nature of the course — and kept a brisk walking pace on the climbs. Walking with Beat proved surprisingly difficult for me as well. For the first time since we started training together, I really noticed how much faster Beat's walking stride is compared to mine. Have you ever followed someone who walks faster than you down a street? You wonder, "Why is this person walking so fast?" as you lengthen your stride and quicken your feet to keep up with them. The motion not only feels unnatural, it's strangely more fatiguing to lesser trained muscles than running. Now, imagine doing this for several dozen miles. But, as pacer, it was my job to maintain Beat's speed, and give him sweaty kisses when he said something funny or sweet. As the hours trickled toward early morning, the heat of the daytime swung extremely and rapidly in the other direction. I had looked at a local weather forecast that called for a low of 40 degrees, so I was prepared with the same clothing that I used in the Susitna 100 (minus heavy socks, down coat and shells), and by 2 a.m., I was wearing all of it, including mittens. Breath condensed thickly in the air and our Stroopwafels developed a nearly frozen consistency. The strange inversion kept the higher elevations relatively temperate at 45 degrees or so, but temperatures in the lower-lying regions near creeks easily dropped into the mid-30s. One crewperson I spoke to swore she noticed ice buildup in standing water bottles, although I doubt the temperature dropped below freezing. Still, for the runners, it was an insufferable change from 90 degrees earlier in the day. Steve caught up to us and admitted he was no longer fantasizing about the Susitna 100. His gloved fingers were so cold he was reduced to shoving them down his pants, prompting more jokes from our frozen tundra days. For me, properly dressed and relatively fresh, it was all good fun. But for the runners still reeling from earlier heat sickness, it was added insult to injury. But, as it does in the best moments of real life, the sun always comes up for long-suffering ultrarunners. 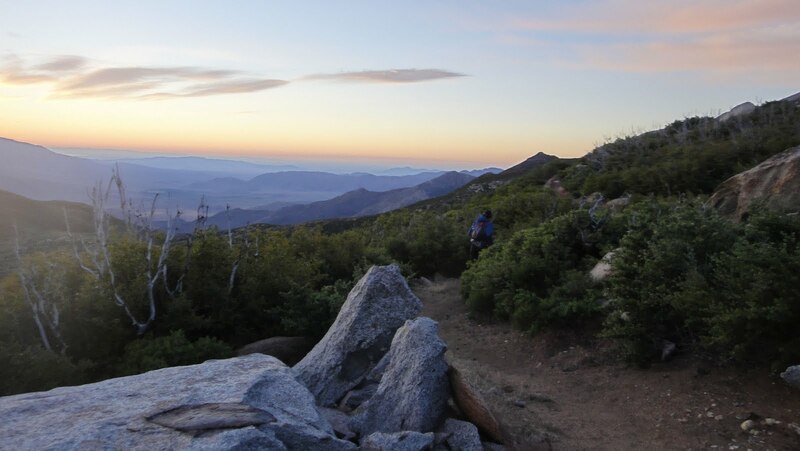 We left the mile 80 aid station and started along a particularly stunning section of the Pacific Crest Trail just as the night sky gave way to a spectacular strip of crimson red light over the desert horizon. Despite staying awake all day and night and traveling 30 miles, I didn't feel all that much physical fatigue, but my left foot had developed a pain that was transitioning from "annoying" to "semi-crippling." It's a burning, highly sensitive sort of pain on the lower outside of my foot; as best as I can determine, the pain is highly localized in either the lateral plantar fascia or connecting tissues surrounding it. I call it "hurty foot" because it feels like a bad bruise but doesn't seem to have the lingering effects of full-on plantar fasciitis. Of course, I always worry that it might develop into such. I've only developed the full extent of this pain three times, all during 100-mile races. The last time it flared up was at mile 70 of the Susitna 100. Beat, like any good pacer would, helped talk me down from extreme grumpiness and the pain eventually numbed a bit. It didn't seem to produce any long-term damage. The time before that was at my mile 40 of the Bear 100. Beat stuck it out with me with me as my hobbling speeds slowed to 2 mph or less, and ended up finishing the race at least two hours later than he likely would have. This time, I didn't want Beat to take another time penalty on account of a broken pacer. Although I was loving our "date" and anxious to see the last 13 miles of the course, I had been reduced to moving too slowly to travel with Beat. I had to drop at the next checkpoint, my mile 37. Beat went on to finish the San Diego 100 in 27:18:35, about 30 or 40 minutes after Harry. The sun brought back Steve's stomach problems and he finished in 27:27:27. As for my hurty foot, I do think there's the good chance it's the result of the unusual motion of strenuous walking over long distances, given that it hasn't cropped up at all during any of my more runnable 50Ks. I will have to stay wary of it ahead of the Tahoe Rim Trail 100, and probably should engage in nightly frozen water bottle rolling exercises. But overall it was a fantastic pacing date. Even though I still don't entirely understand the purpose of pacing, I hope I have a chance to redeem myself as one, someday. We arrived in San Diego on Friday morning and immediately launched into the pre-race rituals of eating, buying more supplies that are likely unnecessary, eating, fretting, driving around, going to a pre-race meeting, eating, staring blankly out the window, and eating. I'm here with four friends who are actually running the San Diego 100, so despite my crew status, I've been going through the motions as well, including the eating. It's 10 a.m. and I've already had two breakfasts, with a third on a plate just waiting for my stomach to clear a little space. I may or may not end up pacing 50 miles starting this evening. For now, all I can do is wait, and kill a little time. I actually enjoy having mandatory time to kill, allowing for guiltless reading of blogs, napping, reading magazines, and eating ... it may not seem like I have too many responsibilities, but true boredom is not something I indulge in very often. I grabbed a quick picture of my friends Martina, Steve and Beat just minutes before the 7 a.m. start of the race. This photo nicely captures the mood of the morning. Martina is the woman I'm supposed to pace starting at mile 51.3, sometime this evening. The outlook that I'll have an opportunity to do this is not overwhelmingly positive right now, as you can probably discern from the look on her face. 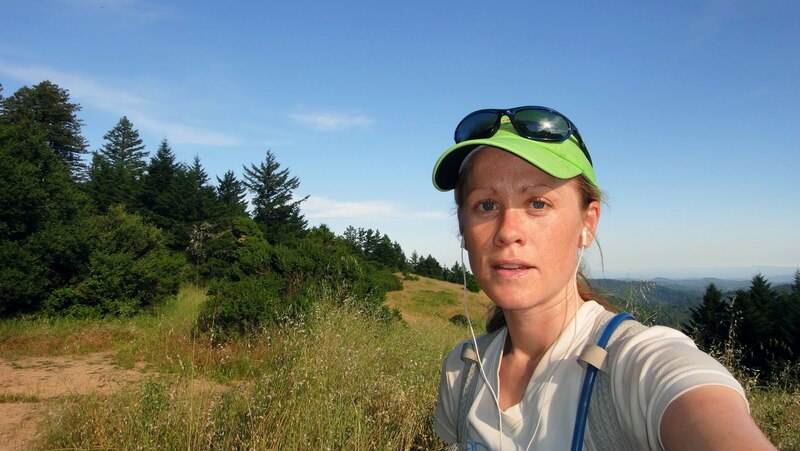 She's not feeling too much optimism about the prospect of her first 100-mile finish here. As for Steve, this will be his third 100-mile run this year, and I think he has a kind of "wait ... why am I here again?" look on his face. Beat's in for his fourth 100-miler of 2011, his fifth at the San Diego 100, and I think 30th or more over his ultrarunning career. So Beat is geared up for the simple pleasures of a known challenge - emerging from coastal fog, high ridgeline views, the desert at midnight and Haribo Fizzy Colas. If Martina drops out early I'd like to catch up to Beat somewhere farther down the trail and join in on the fun. I'm thrilled just to be here, on a high ridge of the Laguna Mountains just a few miles north of the Mexican border. It's an impressively gorgeous region, where cool coastal fog creeps around the rugged slopes of desert mountains. I want to run here; I want to run 100 miles here, but it's not my time for that. For now all I can do is wait, and sit on this bench overlooking the Anza-Borrego Desert in the pleasantly warm June sunshine, and be happy that today, I get to wait here. I still vividly remember the first time I interacted with a runner in the midst of a 100-mile trail run. It was July 2007, on a rock-strewn trail just below Resurrection Pass on the Kenai Peninsula in Alaska. 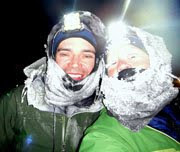 My ex, Geoff, was running the 50-mile version of the Resurrection Pass 100. I borrowed a mountain bike from a friend and planned to shadow Geoff's trail and cheer him on when I passed. Of course, I made the mistake of leaving about a 45 miles after the race started, so of course I never caught up to him (this is before I realized that I on a mountain bike had no chance of moving faster than Geoff Roes on foot, even in a self-supported 50-mile run.) It rained buckets all day long, until the muddy, rocky singletrack wore the borrowed bike's rim brakes to metal and I had to walk most of the descents. I was walking my bike down one of the last steep sections of trail when I passed a woman bathed in chocolate-colored mud and walking with a pronounced limp. The organizers of the unofficial race started the 100-miler at about 3 p.m. the afternoon before in an effort to wrap up the 100-mile and 50-mile race at about the same time. This woman had been racing for nearly 24 hours and still had about 16 or 17 more miles to go. She wasn't moving much faster than 3 mph, maybe 2, downhill, and her stilted body language spoke to an intense difficulty in each step. At the time, that kind of effort was nearly impossible for me to comprehend. The Resurrection Pass 100 had only two aid stations, one at mile 44 and another at 88. 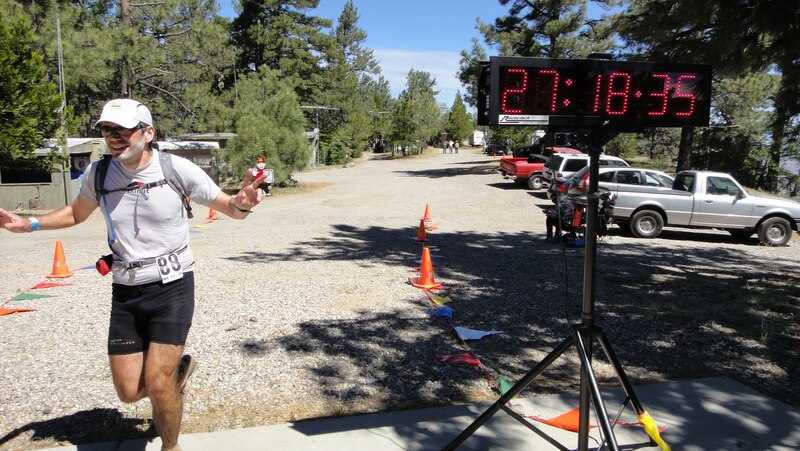 The cruelest part of the 88-mile checkpoint was that it was also the finish. Racers had to leave from that checkpoint and run another six miles uphill on a steep gravel road, and then turn around to wrap up the 100. More than a few competitors, unable to face the psychological Everest of the spur, have called it quits at mile 88. I would even meet another woman a couple more miles down the trail who swore it was her plan to do exactly that. I just assumed that was the fate that awaited this obviously suffering runner. "Wow, this is a full-on mud trap," I said as I passed, trying to inject just a bit of humor into the situation since I was walking a mountain bike downhill and we were both caked in grime. And even though I already knew the answer, I asked, "Are you in the 50-mile race or the 100?" "The 100," she said in a raspy voice. "My calves are shot," she replied. "Feet are painful. I'm wiping out a lot." My brakes are shot," I said. "I'll probably have to walk most of the way back to Hope." She looked at me with this bloodshot, memorably intense look of determination in her eyes. "Rather be you than me," she said. "But I'm going to finish this. Even if it takes me all night." I nodded. "Great race. Good luck." I never did learn whether or not the woman finished the race. But I believe she did, and even though I never learned her name, she lingers in my memory as the kind of "hard woman" that I admire and seek to emulate. I still think of the look in her eyes when I encounter moments of weakness and pain, and it really has made a difference in my outlook over the years. I've since had a few of my own "100-mile-stare" experiences, both on the outside and inside-looking-in. Few "single-day" endurance efforts fascinate me more than a 100-mile run. I'm really looking forward to traveling to San Diego this weekend, meeting some of the 150 runners signed up for this endeavor, and shadowing the race myself as a pacer. Despite recent injuries, my friend Martina has decided to start the race after all. The original plan was for me to pace her, and I still hope to do so if she pushes beyond mile 50. Whereas for Beat the SD100 is almost a longer "training run," it's a truly unique experience for Martina, and pacing her — if the opportunity arises — may just provide a wholly new education in determination. The Tour Divide also starts this weekend, Friday morning to be exact. I won't really have a chance to follow the progress of the race at all until Monday, but it will be interesting to see where the starting field of 70 southbound and 15 northbound riders are strung along the course three days into the race. It's a unique year because of flooding and record snowpack in the Rockies. Significant sections of the course have been rerouted, but the riders are still likely to encounter plenty of swollen streams and snow fields. And despite the re-route, there's still a good chance my overall women's course record will fall this year. 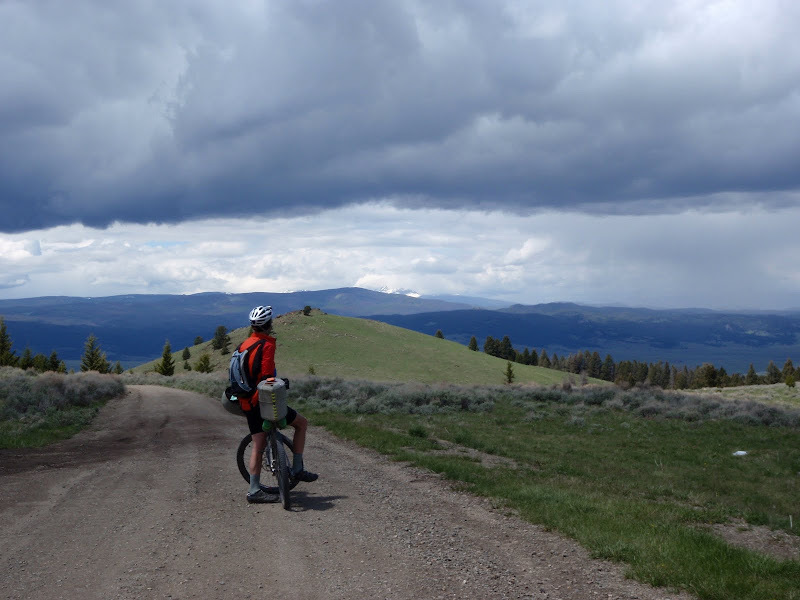 Cricket Butler, now a two-time veteran of the Tour Divide, delayed her start to June 30 and as far as I understand it, plans to ride the Great Divide Mountain Bike Route in its entirety. Cricket beat me handily in every single stage of TransRockies last summer, so I know she's a better mountain biker than me. I'll be cheering her on especially starting June 30, but I wish all of riders the best of luck and an amazing experience. I'm just wrapping up the final proof on my own Tour Divide story and hope to have the paperback ready to distribute by next week. I've received some interesting feedback from readers so far, several of whom either know me personally or are directly involved with Tour Divide racing. To make a sweeping generalization, the women I've heard from have been almost overwhelmingly positive, while men seem to have a more reserved viewpoint on the book, using terms such as "brutally honest" and sometimes an outright "too personal." This book is quite personal, and I admit probably more than a little uncomfortable at times. It's a book about coping with what emotionally amounted to a divorce as much as it's a book about racing a mountain bike 2,700 miles. In the name of full disclosure, I probably should have titled the book "How to Ride the Tour Divide When You're Kind of an Emotional Wreck." After I wrote up the first draft, I went through a range of outlooks about this book, from deciding I would never publish it to trying to re-write the entire thing so I could gloss over the personal stuff. In the end, I decided it was important to my integrity as an artist to maintain a raw kind of honesty, because ultimately that was the truth of the experience. The 2009 Tour Divide happened during an unsettled and upsetting chapter in my life, and my reactions, and the way I interacted with others — including my ex-boyfriend and fellow racers — weren't always admirable or fair. I've since adjusted my outlook and have an amicable relationship with Geoff — in fact, I'm really, really excited for this year's Western States 100 — but the period of time I captured in my book is, amid scenes of overwhelming beauty, sometimes ugly. So there you have it. I hope you'll still read the book and share your honest opinions with me. Writing, just like endurance racing, is an endless learning process. Also, for kicks, I recently distributed a few "lender" copies at a bibliophile Web site called LibraryThing to get reactions from readers who had never heard of the Tour Divide and probably had little interest in endurance racing. So far I've already received a few short reviews. You can read them here. If you want to read along during the Tour Divide but don't have an e-Reader, you can purchase a PDF of the book that will work on any computer with Adobe Reader or other PDF viewer program at a 20-percent discount — $7.16 — for the duration of the race at this link. You can click on the "preview" link below the book cover to preview the first 20 pages. Signed paperbacks will be available for $15.95 plus shipping within the next week or two. The day after the Canyon Meadow 50K, Beat and I went out for a long mountain bike ride. I call it long because, to most people, a 26-mile mountain bike ride with 3,300 feet of climbing is on the moderate to long side. When just went out for the fun of it; Beat wanted to ride the Fatback because it's been a while since the Fatback's been out, and also because we expected to run into mud from the weekend's heavy rain. I was feeling slightly sluggish and had some residual tightness in my hamstrings from the race, but my Garmin stats showed a similar heart rate and speed, proving that, for the most part, a 31-mile run doesn't even force me to skip a beat these days. I like that about my fitness and also my general pacing. A 50K doesn't shut me down because, to put it simply, I don't run fast. Of course, "fast" is all relative, even when I just compare myself against myself. I do run fast compared to what I could do a year ago, but slow compared to what I'm likely capable of. There's an age-old dynamic in there that I still struggle with. Of course a side of me wants to be "fast." That side will be thrilled if I start to get my 50K finishing times under six hours or collect a few mugs at more competitive local races. That side of me might even be tempted to sign up for a road marathon just so I can see where I fit in with the grand scheme of "running." But as I become more entrenched in my outdoor-seeking lifestyle, I become less interested in seeking the outer limits of my speed abilities. Why? Because, in my experience, the pursuit of speed skirts an edge that can easily lead to injury, burnout, and a frightening lack of outside time. 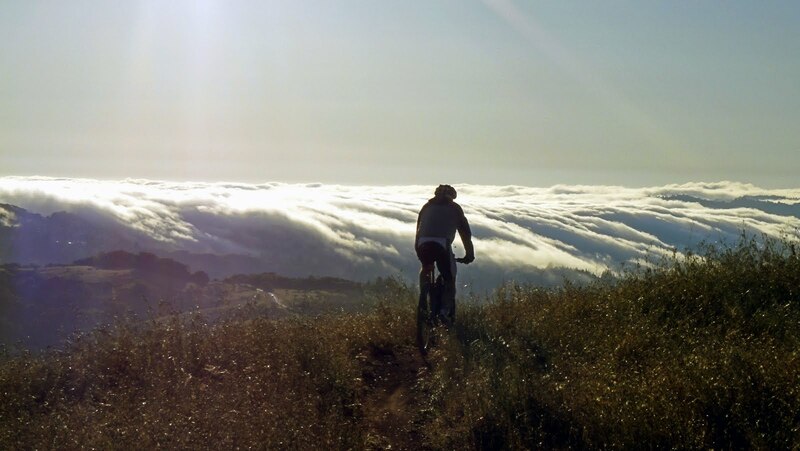 But the pursuit of consistency has led to a condition where I can go for a fun six-hour run in the mud one day, and an exhilarating three-hour mountain bike ride the next, without issue. Who knows what kind of couch-bound pain I might frequently find myself in if I tried to run as fast as I could, all of the time? We all have our rewards. But it's true, for someone who claims not to really care about results, I participate in a lot of races. Both of my memoirs are about racing. And I've structured the entire first half of my summer around a race, the Tahoe Rim Trail 100. The contradictions I see in myself have sparked a new nonfiction project idea that I'm starting to research — an article about the ways racing, specifically endurance racing, has become synonymous with adventure, and vice versa. This project started when I began looking into the history of the Alaska Wilderness Classic, arguably the original "adventure race" and still one of the most difficult races you've never heard of. For the people who organized this race back in the early 1980s, it wasn't enough to cross 200 miles of undeveloped, sometimes uncharted Alaska wilderness using any human-powered means they could. They wanted to do it as fast as they possibly could, and to record who could do it the fastest. Why? What drives them? And how do they compare to the motivations of those lining up for the Tahoe Rim Trail 100, or the Tour Divide, or the Canyon Meadow 50K in monsoon rains for that matter? It's a rather vague question to ask but I think researching it could reveal more than a few interesting profiles and stories, and maybe even larger insight into the modern condition. That's always the hope. But this is just one project I've started to outline, among several. Meanwhile, Beat and I are gearing up to head down to San Diego for the San Diego 100 this weekend. Beat is entered in the race and I'm planning to pace either him or our friend Martina for the last 50 miles, hopefully. The San Diego 100 is considered to be more of a "runner's race," which means even as half of a 100-miler, I'll still likely have to cover this distance considerably faster than I have yet, during the last half of the Bear 100 and the whole Susitna 100. And honestly, my role is actually less of a "pacer" and more of a "protegee" trying to learn about the ins and outs of a trail 100-miler. 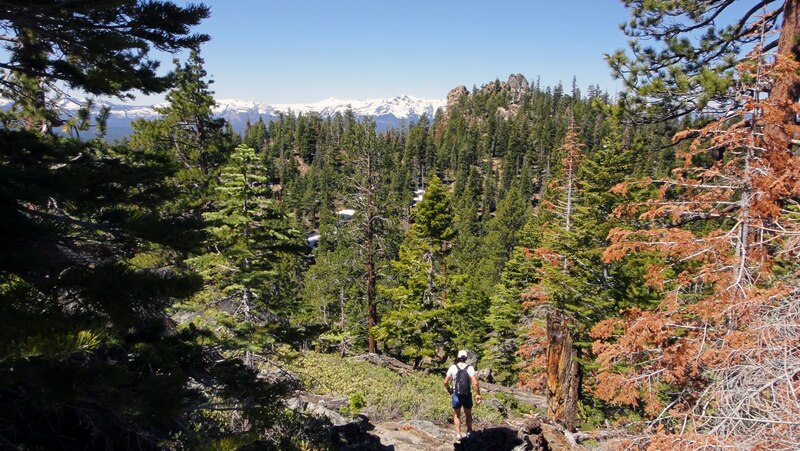 So my goal is just to keep up, learn tons, and go into Tahoe Rim Trail that much stronger, mentally. Because, ultimately, when it comes to my racing, mental strength is what I'm seeking. That's my motivation, and reward. The rain was hitting the window so hard that I could hear it over my 5:45 a.m. alarm. I slid out of bed and slumped through that sick feeling I get when I only sleep for four hours and rise before proper sunrise. Only there was no sunrise this morning, at least not in the Bay area. I asked for rain, and I got it. Record rain. I gathered up my unusual race equipment — unusual for June in Oakland, at least: Soft shell jacket, tights, arm warmers, hat, gloves, and Brooks Cascadia shoes with Drymax socks. I do about 90 percent of my running in Hoka One Ones. But in sticky mud, the Hokas have about as much traction as a pair of skis. And today was going to be a mud day if ever there was a mud day. We were halfway to Oakland when Beat asked, "Did you remember your poles?" And I realized with a tinge of dread that I had forgotten my hiking poles. The night before the Canyon Meadow 50K, Beat and I discussed the weather forecast and the typical condition of Redwood Regional Park trails when wet. We both agreed I would probably need stabilizing devices to help prevent me from breaking my clumsy bones. Then the record rains came and I managed to forget my main safety net. Shoot. Despite the dismal weather, a fair number of people showed up for the multi-distance trail race. At the start, Beat and I agreed to go solo. Both of us assumed I'd be quite slow in these conditions. I promised to be careful and watched him quickly pull away from me. The initial climb was steep and slick — the kind of trail conditions where every step forward resulted in a half step back. The mud was like wet glue — my shoe would slip and the resulting friction would nearly pull it off my foot. I'll be honest and admit I felt a thick sort of dread churning around in my stomach. Thirty-one miles of this? No way. Rather than taper off as one might expect, the rain only picked up velocity and volume with each passing mile. It was difficult to take photographs because my camera lens became instantly soaked. 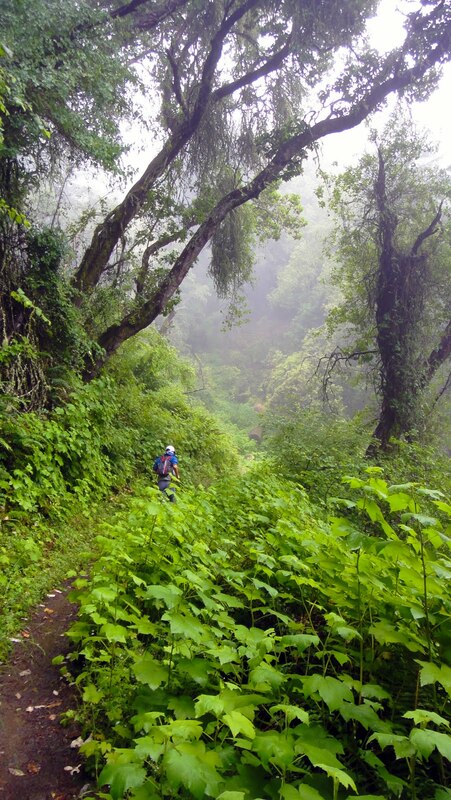 The thick fog closed in and the slippery trail demanded unwavering attention. The already monotone shades of the surrounding landscape faded into an all-encompassing tunnel of focus. I fell into a meditative, quiet mind sort of rhythm. Step, slide, catch, step step catch, step slide catch. The only thing that seemed to break my trance were the aid stations. During 50K races, I've developed a habit of choosing a single, seemingly random aid station offering and consuming only that for the duration of the race. Once it was PB&J sandwich quarters, another time peanut-butter-filled pretzels, and another time brownies (bad choice, that one.) Today it was Clif Shot Bloks and Coke. At the mile 18 aid station, I caught up to Beat. He was surprised to see me, and possible even more surprised to see that I wasn't completely covered in mud. "I've had some slips but I've managed to catch them all," I said. This sudden awareness of myself broke my quiet-mind rhythm and I felt a lot more herky jerky as I tried to keep up with Beat. He disappeared down the trail but I managed to catch up to him again several more times. After a few more miles, we just naturally settled into running together. The Canyon Meadow 50K consisted of two half-marathon-legnth loops with a five mile third loop for the 50K runners at the end. This meant we had to climb the same horrible 1,000-foot mud slide three times. Overall I felt good, but the constant negotiating of spasmodic terrain was slow murder on my IT bands and hamstrings. By the third loop I was hurting and slogging a bit, but still felt fairly strong. About a mile from the finish, I heard the loud sloshing of footsteps from behind, moving faster than mine. As the runner overtook me, I noticed she was another woman with a 50K bib. Beat nudged me and pointed to her. I just shrugged my shoulders as if to say, "So what?" Beat and I had joked about winning Coastal Trail Run races so I could hold my lead in the Ultra Trail Blazers awards, but I seriously doubted I was in front of the women's race. So what if I got fifth place instead of fourth? But as I watched her pull away, a more primal sort of rhythm settled in. I quickened my stride and surged toward her. I caught up to the woman and accelerated past her, legs pounding the pavement, jagged breaths searing my throat, sprinting for all my little legs could sprint at mile 30.5 of a 31-mile race. "Wow," I thought. "I'm actually racing! This is what it feels like to race!" Honestly, during all of the competitive events I've ever participated in, I've never had to face an outside competitor so directly (since I'm usually mainly "racing" myself and there's no one else around for miles.) I fluctuated between worrying that this woman thought I was an deluded aggro type, and strategizing my attack if she managed to pass me again. But the sprinting itself felt amazing. All of the soreness in my legs drained away and a warm rush of adrenaline filled my blood. This must be the beauty of a sprint finish — all of the fun of running fast without having to pay for it later. I never looked back. I crossed the finish line and turned around to watch Beat, followed closely by my competition, 45 seconds later. As it turns out, I actually was leading the women's 50K race thanks to a few faster gals dropping out at the 30K mark due to the heinous trail conditions. Perseverance pays off. So I earned my third win from Coastal Trail Runs. Three for three. Thanks to the sprint finish, I also set my own 50K PR, 6:10 (my old one was 6:12.) And I got all of the rain I could possibly wish for, another confidence-blostering training run and another cool coffee mug. Good Saturday. Garmin stats here. After three months of living in California, one thing I hadn't yet witnessed was a change in the weather. Oh, most Californians still talk about weather. Their senses are so refined that they can detect the difference between 68 degrees and sunny and 72 degrees and partly cloudy. They tell me this has been, similar to much of western North America, the coldest spring in a long time. There was that one day I rode the Fatback to the top of Black Mountain in a cold, windy downpour (March.) And then, mere days after we flew home from Alaska, the temperature nearly hit 90 degrees (also March.) And then there was that 50-degree evening in late May when I complacently climbed a mountain on my road bike without any warm clothing and suffered the worst chill I've experienced since February in Alaska. But for the most part, I'm almost starting to forget what it's like to be uncomfortable outside. I admit that sometimes I miss the rain. After four years in Southeast Alaska, my memory still clings to those gray months when every single pair of shoes I owned would be propped up against the wall in line for the shoe dryer, every single jacket hung on doors and dripping gritty water on the floor, every single bike ride an exercise in blinking away sharp raindrops while slowly accumulating water weight through many layers of sopping clothing. It's not that I really want to go back to that kind of saturated, honestly dreary lifestyle. But back in those days of extreme weather changeability, there was true, ecstatic magic in every sunny day. Sometimes I feel like coastal California is the weather equivalent of eating lobster every day. Sure, the California suns casts remarkably brilliant light. But will it eventually stop tasting so sweet? On Tuesday, it was sunny in the valley, but when I looked toward the mountains, I saw a thick crown of clouds streaked with rain. While I lived in Juneau, I often went to the mountains to escape the fog-shrouded channel in search of sun. Interestingly, now, I feel a strong desire to seek out the rain. I drove to the Saratoga Gap trailhead, where a steady stream of precipitation was soaking the parking lot. I pulled on my arm warmers, jacket and hat. Through the cold wind, I practically sprinted toward the singletrack, lost in a rush of anticipation and memories. Raindrops slipped through the thick canopy and hit the trail with a jazzy sort of rhythm. Bright green moss glistened with moisture and curtains of silver clouds draped the mountainside. Wet brush and grass instantly soaked my pants and shoes, but I felt more energetic than I had in a week. I bounded down the trail as far as I could muster and still make it back in time to celebrate Beat's birthday — about three and a half miles — and ran back as the clouds rolled west and the first hints of sunshine reached the ridgeline. Recently, there's been a mass exodus of my friends from Juneau. Last weekend, as another one packed up to leave on a beautiful warm summer day in Southeast Alaska, he questioned his sanity in an online update. Our mutual friend Will replied, "No one leaves Juneau for good; it's like your prom date, or the car you learned to drive in — nostalgia brings em back." It was cold and cloudy again on Wednesday. Beat and I went for an evening mountain bike ride on the Black Mountain/Stevens Creek Canyon loop. The sun came out, only once, for a gorgeous mock sunset right at the top of the climb. Stevens Creek Canyon is a fantastic ride. It starts from home, in the suburbs of San Jose — the third largest city in California. 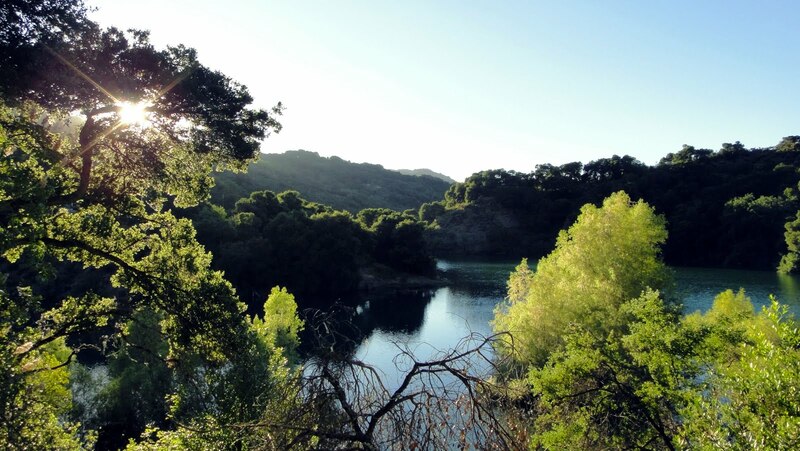 We ride amid thick rush-hour traffic beside Interstate 280 and veer into the road cycling haven along Stevens Creek Reservoir. 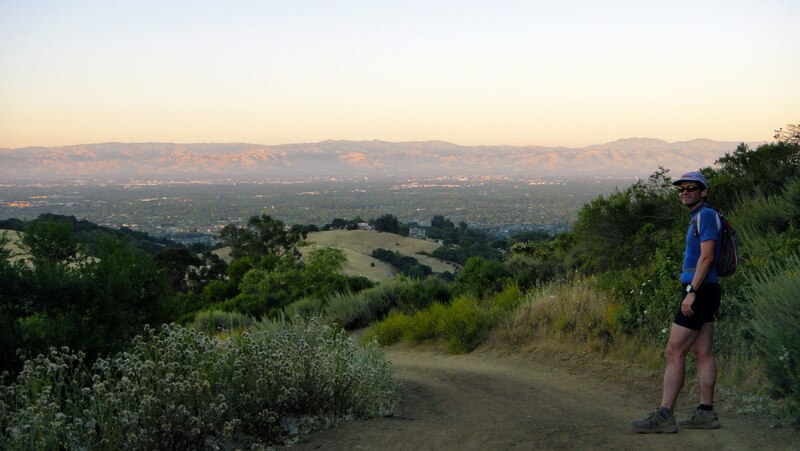 We climb up Monte Bello amid gurgling creeks, idyllic wineries and wide-ranging views of the San Francisco Bay. Atop Black Mountain, the views open up to the green ridges of the Santa Cruz Mountains and the shimmering Pacific Ocean in the distance. 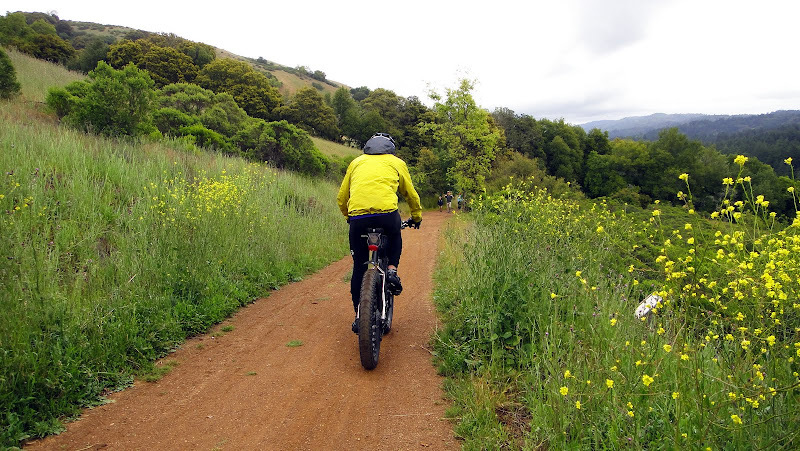 Coyotes, deer, rabbits and crazy suicidal squirrels dart across the grassy fields as we veer onto singletrack and descend the dusty, swooping trail into Stevens Creek Canyon. 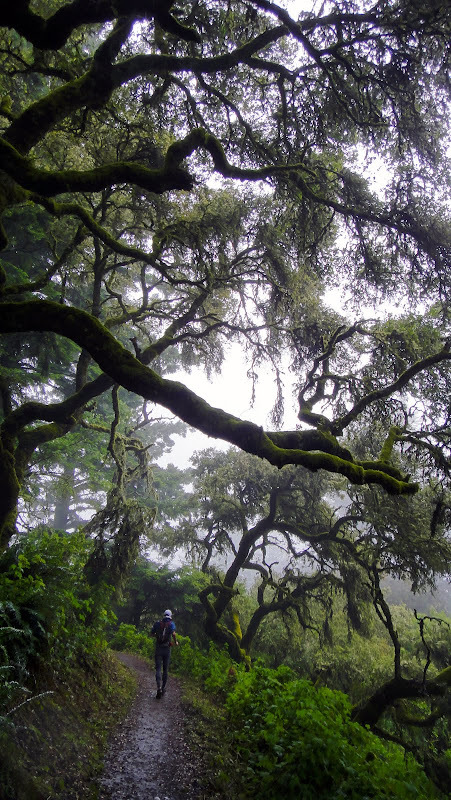 The canyon itself is a different world, lush and shrouded with towering redwoods. The trail rejoins the road in a strange, rural-Montana-like residential area with rustic buildings halfway hidden in the trees. Then it's back to Cupertino, upscale apartments and children playing soccer in the park. It's like a tour of four distinctly different environments, in 26 miles. But the rain never did make an appearance. It was just as well. Beat and I were looking for something to do this weekend before we head down to San Diego so he can run the San Diego 100. Beat is for some reason philosophically against tapering, so he suggested entering the Canyon Meadow 50K as a training run for me and easy "taper" run for him. It has also become a joke between us that I need to enter as many Coastal Trail Run events as I can because I have a title to uphold. Thanks to the fluke of winning two smaller CTR races due to a dearth of competition, I'm actually leading the women's 50K group in the Trail Blazer Awards. "Now you have to defend it," Beat said. I just laughed because there are already about a dozen other women registered for that race. It's extremely unlikely my inexperienced beginner/strategic-100-miler pace can win me another 50K. But then I asked Beat what the weather was going to be like. "Hmmm, 61 degrees in Oakland," he said. "90 percent chance of rain." A smile spread across my face. "Let's do it." On Thursday, we went for a one-hour taper run. The sky was almost clear again, and the evening light so rich that the landscape glowed in iridescent colors. Beat joked about sore legs but then motored up the steep incline as I gasped and dug deeper to keep up with him. We stopped at the top for a brief, sweat-drenched kiss and watched the pink light wash over San Jose. Sometimes I think I miss the rain, but then I remember why I came here.